The window to slap a franchise tag on a player opened up this week, and the league saw just one player receive their franchise’s tag so far – Jarvis Landry of Miami. While that window opening may have only seen one player, there were noticeable players that were also released into the vast free agent pool including a few linebackers we outlined in our free agency update on Thursday. The NFL’s free agency period is anxiously awaiting players, coaches, teams and fans alike, so let’s take a look at the unrestricted free agents on the defensive side of the ball who should arguably be the most sought after this March. These players can be found broken down in much more detail in the first ever PFF Free Agent Guide, released earlier this offseason for our PFF Edge & Elite subscribers. Stay tuned to our exclusive PFF Free Agent Tracker all offseason long, as we’ll have all the signings, big and small, updated as they happen. Hayes is the forgotten man on the Dolphins defensive line opposite Ndamukong Suh and Cameron Wake, but that doesn’t mean he didn’t perform at a high level in 2017. While he may have not played enough snaps to qualify for a ranking, Hayes put forth a season grade of 85.6, his fifth grade over 80.0 in the past six seasons, and one that would have placed him tied with Ryan Kerrigan at 18th among all edge defenders this year. He recorded 17 pressures on just 122 pass-rush snaps this year and managed to bring on 16 run stops on his 19 total tackles in run defense. Hayes is a proven veteran who can both rush the passer and stop the run, and that should peak team’s interests. A longtime fixture in the Packers secondary, Burnett is still just 29 years old, and the veteran proved to have enough in the tank this past season to warrant looks this offseason. He finished the season with a 77.3 overall grade, his first season under 82.0 since 2013, but still good enough to be ranked within the top 50 at his position. A third-round pick back in 2010, Burnett finished the season with the highest tackling efficiency among safeties with at least 200 snaps. On the year, he missed just two tackles on his 55 total tackle attempts while recording 18 defensive stops. He’s more than just a safety valve, and Packers fans would surely be sad to see him go if he and the team did part ways. Poe is a space-eater along any defensive front and plays well with his size to clog up the defensive interior. After breaking onto the scene in 2013 with Kansas City, Poe finished his five years with the Chiefs with only that one season with a grade north of 78.5. He joined Atlanta on a one-year deal last offseason and finished as the league’s 35th-highest graded interior defender in 2017 at an 81.5 overall grade. Was 2017 a sign of things to come for Poe? There is no doubt teams will be willing to find out and sign the former 11th overall pick from 2012. In a career move for the best, Joyner switched to more of a full-time role as a safety in 2017, a role he formerly played while at Florida State. He did so with great success after three underwhelming years as a slot cornerback with the Rams to start his career. 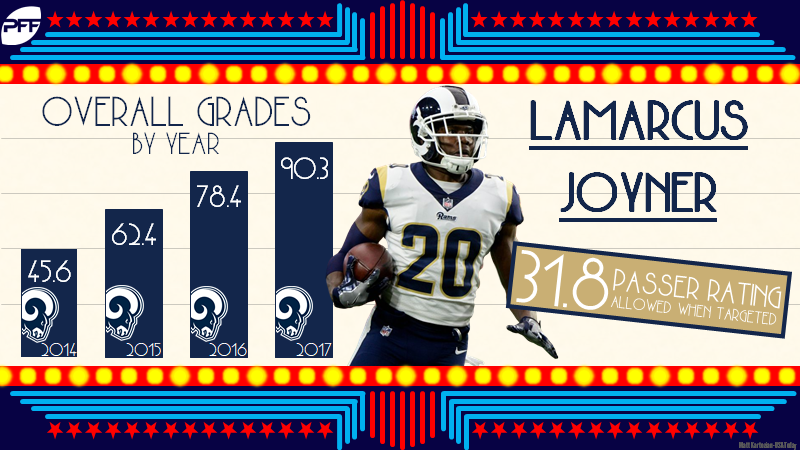 Over his four-year career, Joyner had never graded higher than 78.4 overall, and even included a well-below average rookie season at 45.6 overall in 2014. However, his position switch brought with it a huge jump in grade, finishing 2017 as the league’s third-highest graded safety at an elite 90.3 overall grade. Joyner was absolutely tremendous in coverage this past season, allowing just 12 receptions on 28 targets and recording three interceptions and five pass breakups. On the season, he saw just a 31.8 passer rating on throws into his coverage, the second-lowest of any safety with at least 15 targeted passes. In the right defensive scheme and at more of a true safety, Joyner could blossom into one of the league’s top defensive players at the rate he’s going.